During Cape Wine 2015, trade title Drinksbusiness.com ran an interview with Bruce Jack, founder of Flagstone and head winemaker in South Africa for international wine company Accolade Wines, on Chenin Blanc. 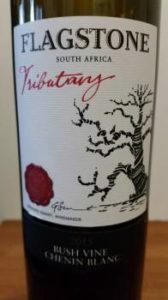 What particularly caught the eye is that Flagstone have launched Tributary 2015, an interpretation of the grape set to sell in the UK at €30 a bottle. From 45-year-old Perdeberg vineyards, 70% was fermented in tank and 30% in barrel. Jack reckons Chenin can offer the freshness of Sauvignon Blanc, the subtlety of Pinot Grigio, the body of Chardonnay and the age-worthiness of Riesling and Tributary 2015 is a remarkable and somewhat unusual take on the variety. Closed under screwcap, the wine is initially shy on the nose and tight on the palate. It, however, opens up wonderfully to reveal aromas of citrus, pear and peach, some talcum powder, potpourri and dried herbs. The palate shows fabulous fruit concentration and driving acidity, a little bit of phenolic grip adding interest on the finish. It’s muscular and lithe and not nearly as oxidative as other top-end examples often are. Next articleTim James: What’s really happening in Cape wine these days? What’s your take on aged Chenin? My only experience has been drinking a 6-year-old bottle of Simonsig Chenin, which I was very pleasantly surprised to find was still perfectly enjoyable (but I can’t say I could tell that it gained anything from the time in the bottle). Which, if any, of SA’s Chenin do you think is age-worthy? For how long? And how do you think the flavours may change? Hi Joe, How long to age SA whites in general is a question which doesn’t get explored enough. Producers are always willing to show reds going back 10 years or even longer but this is almost never the case when it comes to whites. Speaking personally, I like some age on my whites for optimal enjoyment but two or three years usually suffices (primary fruit not completely dissipated but some complexifying developed character starting to appear) and I certainly can’t say I keep very many white wines beyond five years.